🎓 Creating a College-Going Culture! 📆 PMA Parents & Guardians, please join us every Tuesday from 6:00- 7:30 p.m. for our PIQE Workshops! Check out, like, & follow PMA's Facebook Page! Currently enrolling 8th and 9th graders! Limited spots available! 7th grade has a waiting list! 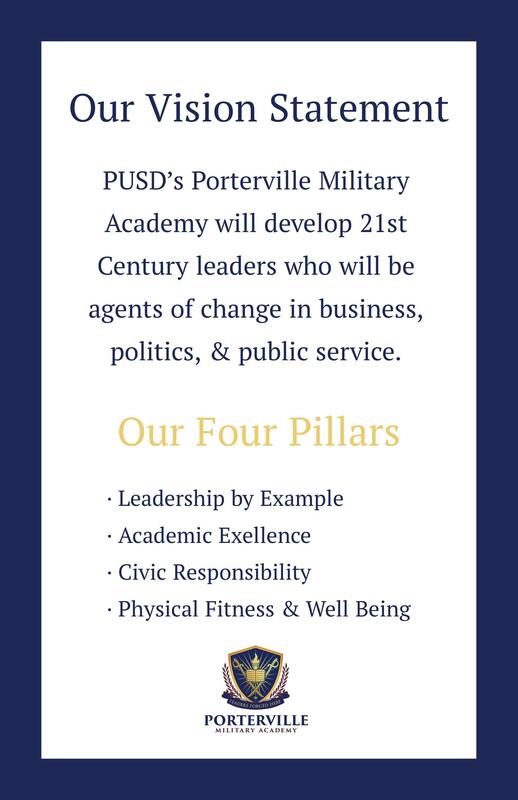 The Porterville Military Academy has only six spots remaining for incoming 9th-grade students this year. If you are interested in attending PMA, please stop by the PUSD Pathway Office (600 W. Grand Ave.) before enrollment is filled. Once closed, students will be placed on a waiting list. There is currently a waiting list for 7th-grade students with a limited number of spaces still available for 8th-grade students. PMA is thrilled to announce that our Chromebooks have arrived! We are looking forward to serving as a 1:1 school in which each of our 7th, 8th, & 9th graders will have their own device and get to take them home. We look forward to using them as tools to create a 21st century learning environment to support collaboration & innovation. 7th & 8th Grade Cadets will be released at 1:45 p.m. each day of the week of October 15th. 9th graders will be released at 3:30 p.m. except on Wednesday which is our regularly scheduled Early Release Day. All Cadets will be released at 1:45 p.m.
Parents & Guardians are more than welcomed to meet with their Cadet's Teacher anytime between 1:45 to 3:50 p.m. except on Tuesday. On Friday, Parents & Guardians are welcomed to meet with their Cadet's Teacher's anytime between 1:45 to 3:30 p.m.
We will NOT be having Parent/Teacher Conferences on Tuesday. On Thursday, we will be holding Parent/Teacher Conferences in the MPR/Cafeteria from 4:00 to 6:00 p.m.
We will also set up a station to sign up for an Aeries Parent Portal and Remind texts for PMA and certain classes. Please report to the front office first and sign in before going into the main building for conferences. Check out a video of our future PMA Cadets at the California Cadet Corps Summer Camp 2018! Click on the link to view the amazing video made by Sergeant Lara! Thank you to all of the PMA Parents and Cadets who attended one of our Orientations this past Saturday and Monday. It was wonderful meeting you. We are honored you have entrusted PMA with supporting your child's academic and personal success throughout their Middle and High School years. As requested, we have uploaded the Google Slides Presentation both in English and Spanish we used for our Orientations on Saturday and Sunday. Click to view the Presentation in English. Click to view the PMA Orientation Google Slides Presentation in Spanish. Porterville Recorder Article entitled "Sneek peek for staff" on the Porterville Military Academy!